Agha Maliki was also fortunate to come into contact in Najaf with the most celebrated Gnostic of that time, Akhund Mulla Husein Quli Hamadani who was highly proficient in the Islamic sciences, especially ethics (akhlaq) and mysticism (irfan). Agha Maliki spent 14 years with him and during this period acquired profound knowledge of moral ethics and applied mysticism from his illustrious teacher. He attained such high spiritual stations in Gnosticism that a great jurisprudent and scholar Sheikh Muhammad Husein Isfahani (famously known as Kumpani) - himself an outstanding authority in irfan – wrote to him seeking spiritual advice and instructions regarding ethics and mysticism. Agha Maliki returned from Najaf to his hometown Tabriz in the year 1320AH, but due to the upheaval at the time of the constitutional revolution, the conditions in Tabriz deteriorated, and he was forced to migrate to Qum . Here, he started teaching jurisprudence from Mulla Mohsin Faiz Kashani's al- Mafatih al-Sharayi’ al-Fiqh. He also began to nurture a special group of students and introduced the more able ones into spiritual wayfaring. He ran two classes in ethics (akhlaq). One was for advanced students, (of whom, Ayatullah Khomeini was one) which he conducted at his house; the other was public, which ran at the Faydhiyya Madressa and was attended by many people, especially market stall holders. He also busied himself in writing and left behind many precious works. Ultimately, after living a fruitful life full of learning, teaching, writing and purification of the self, he left this transient world in1343 A.H. He is buried in the Shaykhan graveyard in Qum , near the tomb of Mirza Qummi. On his grave the following verse is written in Persian: "The world lost its soul, and the nation lost its shelter." About the graveyard where Agha Maliki is buried, Allamah Tehrani states: Agha Sayyid Hashim Haddad (the great ‘Arif, and illustrious student of Sayyid Ali Qadhi Tabatabai) would often mention the special and high status of the graveyard of Agha Tabrizi because of the pious and lofty souls buried there. Allamah continued, “It is proper for students of the Hawza and those who are engaged in spiritual wayfaring to spend much time in this graveyard, in order to benefit from the great spiritual power and blessings that emanate from there. Many other great Shia scholars are buried In this graveyard, including Zakariya b. Idris, Zakariya b. Adam, Mirza Qummi, Mirza Jawad Agha Maliki Tabrizi, Mirza Ali Agha Shirazi and many more. He narrates, “Once after the Fajr prayers, I rushed to the akhlaq class of my teacher, Agha Maliki. He came to stand next to me and asked, “What do you see?” I suddenly became aware of the presence of many souls who had come to participate in the class. They were talking quietly amongst themselves. Haj Agha Hussein Fatimi, a pious ascetic and an intimate friend of Agha Maliki has narrated: "When I returned from the Jamkaran Mosque, I was informed that Haj Agha Maliki has inquired about me. Since, I knew that he was sick I rushed to see him. I found him laying in a bed, neat and clean, bathed, perfumed, and hair dyed readied for Zuhr and Asr prayer. He recited Adhan and Iqamah upon his bed, recited supplications and as soon as raised his hands for Takbirat-al-Ahram and said: Allahu Akbar, Allah is Great, his sacred spirit left his body; thus, the meanings of the hadith: “the Salat is a believer's heavenly journey” become truly manifested for him. Also, the meanings of "get readied for the prayer" 'qad qamat as-salat,' which in accordance to traditions has been described as the time of meeting with the Beloved, too became materialized for him, because he rushed to meet his Beloved with prayer". Purification of the soul and struggle for its perfection is a fundamental Islamic concept. The Holy Quran in an absolutely unique style emphasises on self-purification as the only way to eternal success and salvation. The path to this success is a lifetime struggle and the journey of self purification will end when lovers meet. The methodology of how to successfully pass the trip is the subject of Islamic mysticism called Irfan. However, Islamic Irfan like many other Islamic sciences has been on occasion misused and misrepresented and hence those who fail to distinguish the authentic from the forged tend to deny the whole subject. The weakness of this approach is similar to denial of Islamic jurisprudence (al-Fiqh) for the reason that some so-called jurists have utilised analogy and inference in their deduction or relied on non-authentic Hadiths! From the rise of Islam to this present day, many devoted Muslims have struggled on the Path of nearness to the Almighty Allah. Among them were the true followers of the Imams of Ahlul-Bait (a.s) who were satisfied from the pure prophetic fountain of Kauthar; through the holy hands of Ahlul-Bait. A wayfarer is in inevitable need of a well educated and experienced teacher and mentor who can guide the new and inexperienced wayfarer step by step towards his/her perfection. Stepping into the lifetime journey of self-purification and perfection by reading the mystical texts is more dangerous than self-treatment by reading a medical book. Thus, learned mystics consider it quite mandatory for a wayfarer to work under the full supervision of a learned and experienced mentor and guide. Imam Khomeini (r.a.) enjoyed the company of the best teachers of Irfan during his studying period. After Ayatollah Muhammad ali Shah-Abadi, whom we discussed in Parts 98 & 99, Ayatollah Mirza Jawad Maleki Tabrizi (r.a.) was the second most important teacher of Imam Khomeini in Irfan. The late Ayatollah M.J. Tabrizi known as ‘The Beauty of Wayfarers’ (Jamalul-Salekin) used to hold two types of Irfan classes; one for the public in ‘Faydiyeh School’ in Qom and another, a private one, in his home. Imam Khomeini (r.a) was among his handful of private students. The lessons of Ayatollah Tabrizi were so influential that as he was talking, his students were in tears crying out loud. Sometimes the power of his sincere talks would penetrate the hearts of his students so deeply that they would feel faint. Successful teachers are those who have two types of products; their literature and their students. It is said that even if the life of Ayatollah Tabrizi did not have any result other than his share in building the mystical personality of Imam Khomeini (r.a.) it would be enough for him. 3) Leqa’u-Allah (Meeting with God) which is the best mystical book written on the topic. Irfan with no practicality and worshipping is rather just a bunch of expressions and hence a public fraud. In the school of Ahlul-Bait (a.s) it is impossible for one to gain any spirituality unless by means of worshipping God in its divine prescribed method. The more spiritual the Shi’a mystic becomes the more they observe and practice the Shari’ah law. Observing Night Prayers before dawn was a mandatory condition to be admitted to the lessons of Ayatollah Tabrizi. The late Shaalchi, one of his students narrated: “He (Ayatollah Tabrizi) was very strict about early rising for Night Prayers. The angelic call may appear to you in the voice of your mother, your friend, or even in the voice of Azan, all for the purpose of inviting you to a private heavenly meeting at dawn. For those who are interested in waking up for the Night Prayers it is also very much recommended to recite the last Ayah of Surah al-Kahf (18) in Arabic. Ayatollah Tabrizi in his ‘Asrarul-Salaat’ says: “I asked my mentor, who was the best philosopher, Arif and experienced teacher and the most perfect spiritual physician I have ever seen in my life; “Which one of the physical worshipping from your experience is more effective to the heart? He replied: long prostration for about an hour or ¾ of an hour in which you repeatedly say: “Laa Elaaha Ellaa Ant Sobhanaka Enni Konto Mena zZalemin. [Dhikr Yunusiyah]. A wayfarer is in inevitable need of a well educated and experienced teacher and mentor who can guide the new and inexperienced wayfarer step by step towards his/her perfection. Stepping into the lifetime journey of self-purification and perfection by reading the mystical texts is more dangerous than self-treatment by reading a medical book. Some experts in mysticism assert that what lead al-Hallaj[i]; to publicise his ambiguous statements was the lack of a proper mentor. Thus, learned mystics consider it quite mandatory for a wayfarer to work under the full supervision of a learned and experienced mentor and guide. Imam Khomeini (r.a) enjoyed the company of the best teachers of Irfan during his studying period. Ayatollah Mirza Jawad Maleki Tabrizi (r.a) was the second important teacher of Imam Khomeini in Irfan. The late Ayatollah M.J. Tabrizi known as ‘The Beauty of Wayfarers' (Jamalul-Salekin) used to hold two types of Irfan classes; one for the public in ‘Faydiyeh School' in Qom and another, a private one, in his home. Imam Khomeini (r.a) was among his handful of private students. The lessons of Ayatollah Tabrizi were so influential that as he was talking his students were in tears crying out loud. Sometimes the power of his sincere talks would penetrate the hearts of his students so deeply that they would feel faint. 1) Early Bird Irfan with no practicality and worshipping is rather just a bunch of expressions and hence a public fraud. In the school of Ahlul-Bait (a.s) it is impossible for one to gain any spirituality unless by means of worshipping God in its divine prescribed method. The more spiritual the Shi'a mystic becomes the more they observe and practice the Shari'ah law. Observing Night Prayers before dawn was a mandatory condition to be admitted to the lessons of Ayatollah Tabrizi. The angelic call may appear to you in the voice of your mother, your friend, or even in the voice of Azan all for the purpose of inviting you to a private heavenly meeting at dawn. For those who are interested in waking up for the Night Prayers it is also very much recommended to recite the last Ayah of Surah al-Kahf (18) in Arabic. Seyyed Jawad Shahroodi one of the students of Ayatollah Tabrizi narrated: “Once in my dream I saw Imam Zamaan (a.f) with a group of people as if they had attended the prayer of the Imam. I went forth to visit him and kiss his blessed hand. When I went closer I noticed a very honourable Sheikh beside the Imam on whose face the signs of magnanimity were apparent. When I woke up from my dream I was wondering who that Sheikh was until I met Ayatollah Tabrizi and recognised the face and more surprisingly he also recognised me too. Ayatollah Musa Shobairi one of the students of Ayatollah Tabrizi narrates: “Ayatollah Tabrizi said: I had just written a book on a subject when I noticed that the late Faydh Kashani[iii] has also written another book on the same subject. I was wondering whether I should still publish my book. I offered a special prayer to visit Imam Sadiq (a.s) in my dream and asked him if with the book of Faydh Kashani I had to still publish my book. I saw Imam Sadiq (a.s) in my dream and asked him the question but he was silent. I insisted and he calmly told me: “The book of Faydh is sufficient.” I then destroyed my book! Ayatollah Muhammad Husain Isfahani known as Kompani was an outstanding Muslim Jurist and philosopher of his time. In a letter to Ayatollah Tabrizi he requested him to write a practical prescription for his spiritual perfection. 1. Reducing your meals in that you don't have more than two meals a day and not to have meat more than two or three times in a week. 2. Reducing your sleeping hours in that you don't sleep more than six hours. 3. Endeavour in safeguarding your tongue and abstaining from heedless people. These three will be very helpful in reducing the animality of man. 1. Permanent grief of the heart (not facial) in fear of not reaching your destination. Nearing the end of his life, Ayatollah Tabrizi was very ill and he could no longer even use water for his Wudu. According to Seyyed Fatami-Nia one night before the demise of Ayatollah Tabrizi about 250 Sheikhs in Qom had dreamt that the funeral of Ayatollah Tabrizi was processing and Imam Husain (a.s) was walking in front of his coffin. The following day on the 11th of Thil-Hajjah in the year 1343 A.H. he made his Tayammum for his Noon and Afternoon prayers. He stood up and made an intention for his Noon prayer and as he raised his hands in the middle of his Takbiratul-Ihram his body collapsed and his soul ascended to his Lord to continue the rest of his prayer at the presence of Allah forever. May God bless and elevate his status in Paradise . 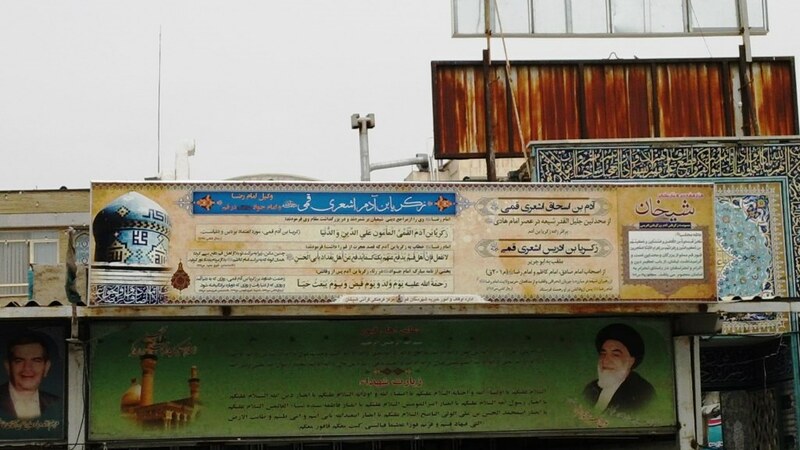 Another important teacher of Imam Khumeini in Irfan was Ayatollah Mirza Jawad Maleki. Sharh Fosoos by al-Qounawi, the second most advanced textbook in Theoretical Irfan, is an explanation on Fosoosul Hekam ( the Gems of Wisdom) by Ibn al-Arabi. Manaselu Saa'erin by Khaje Abdullah al-Ansari with its most famous explanation by al-Kashani is the main textbook in Practical Irfan. [i] Mansour Al-Hallaj was an Iranian famous Sufi lived between 858-922 AD who was persecuted for his ambiguous heretical statement: “I am the Truth”. [v] Tabib Delha, compiled by Sadiq Hasan-Zadeh. The most distinguished jurisprudent and perfect mystic Late Hajj Mirza Javad Agha Malaki Tabrizi was born in Tabriz. After finishing early education at his home town, he left for Najaf al-Ashraf, which at that time was supposed to be the most reputable centre. At Najaf he attended the lectures of great learned jurisprudents such as Akhund Khorasani, writer of Kifayeh al-Usool, Hajj Agha Ridha Hamadani, writer of Misbah al-Faqiyeh, and Muhaddith Nouri, writer of Mustadrak al-Wasail. Also during this period he came in contact with most celebrated mystic personality of that time Akhund Mulla Husayn Quli Hamadani who was unique in knowledge, ethics, and mystics. Hajj Agha Malaki spent 14 years with him and during this period acquired profound knowledge of moral ethics and mysticism from his learned teacher. 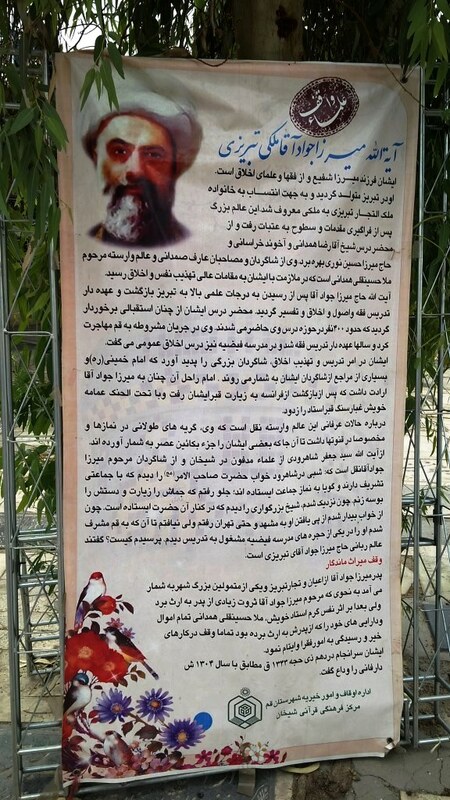 Hajj Agha Malaki attained such higher spiritual positions in gnosticism that a great jurisprudent and scholar like Sheikh Muhammad Husayn Isfahani famous as Kampani - himself an outstanding authority of learning and deeds in a letter to Hajj Agha Malaki seeks his instructions regarding ethics and mysticism. Hajj Agha Malaki returned to his native hometown Tabriz in the year 1320 or 21 A.H. and settled down there, but after few years due to constitutional revolution the condition in Tabriz deteriorated, forcing him to migrate to Qum, where he started teaching jurisprudence from Faiz Kashani's Book: Mafatih as well as taught ethics (Akhlaq). Also, he kept himself busy in writing and had left many precious works. Ultimately, after living a fruitful life full of learning, writing, refinement, and purification of self, he left this transient world to join his Beloved in the morning of 11th, Dhi'l-hijjah, 1343 A.H. His holy remains were buried in Mirzai-Qummi the Shaykhan-Qum Graveyard near the tomb of Mirzai-Qummi. The following verse written in Persian reflects about his precious existence and the year of his demise. “One night in the City of Shahrud in a dream I found myself in a plain where Imam al-Mahdi [a]1, the Lord and Master of the Age, together with a group of his companions, was leading the congregational prayer. With the intention of kissing his hand and salutations, when I approached him, I saw a Sheikh whose face was the manifestations of virtues and perfection sitting near the Imam. After awakening from this dream I kept thinking deeply about the dignified Sheikh who is so close to the Imam [a]. I was so much interested to identify and meet him. 3. Late Malaki has a son who is the source of warmth and pleasure for his household. On the Day of Eid al-Ghadir2, when traditionally people visit the elderly personalities to offer greeting, his house is full of visitors. Suddenly, a female servant discovers the dead body of his son floating inside the yard's water pool. She starts crying; the other women folk of Hajj Agha Malaki's household join her in loud crying; having heard the loud screams Hajj Agha Malaki comes to the backyard and sees the lifeless body of his dear one; he controls himself and asks the women folk to stop crying, the women stop lamentation and become silent, the dead body is placed in a corner and they return inside the house in order to treat the visiting guests. Some of the guests remained for the lunch at his house. After the lunch, when the guests asked permission to leave, Hajj Agha Malaki says to some of his close friends: 'Please don't leave, I have to tell you something.' When all the guests leave the house, he informs them about the tragedy of his son's demise and seeks their help in making the necessary arrangements for the funeral. “When I returned from the Jamkaran Mosque, I was informed that Hajj Agha Malaki has inquired about me. Since, I knew that he was sick I rushed to see him. I presume it was Friday afternoon, I found him laying in a bed, neat and clean, bathed, perfumed, and hair dyed readied for Dhohr and Asr prayer. He recited Adhan and Iqamah upon his bed, recited supplications and as soon as raised his hands for Takbirat-al-Ahram and said: Allahu Akbar, Allah is Great, his sacred spirit ascended towards the Celestial Kingdom, thus, the meanings of the narration: the prayer is believer's heavenly journey become truly manifested for him. Also, the meanings of “get readied for the prayer” 'qad qamat as-salat,' which in accordance to traditions has been described as the time of meeting with the Beloved, too became materialised for him, because he rushed to meet his Beloved with prayer”. Rehanateh al-Adab, vol.5, p.397, Naqba al-Beshar, vol.1, p.330, Ganjinai-danishmandan, vol. 1, p.232 , preface to Resala Laqa-Allah and Simai-Farzangan pp. 60-70. 1.Imam al-Mahdi [a]: The son of Imam Hasan al-'Askari was born in Samarra on Friday, 15th. Sha'ban 255 A.H. The twelfth Imam lived in hiding under the protection and tutorship of his father until the latter's martyrdom, when by Allah's command he went into occultation, during a period known as Lesser-occultation (al-Ghaybat al-Sughra). During this period, four special deputies in succession would answer the questions of the Shi'ah and resolve their problems. After that in the year 329 A.H., the Imam [a] went into the Greater-occultation (al-Ghaybat al-Kubra) until a day when by Allah's command he will reappear to fill the world with justice as it is now filled with oppression [Tr]. 2.Eid al-Ghadir: In the tenth year of the Hijra, the Most Noble Messenger [s] set out from Mecca to perform his final, farewell Hajj. After carrying out the rituals of the pilgrimage and imparting necessary teachings to the people, he set out for Madina. When he was returning on 18th. Dhi'l-hijjah (10 March, 632), on the road at a locale known as Ghadir al-Khumm (Ghadir-Pond), he ordered the caravan to halt. In the midst of one hundred and twenty thousand pilgrims from all over the Arabian peninsula, he took 'Ali's [a] hand, raised it aloft, and declared: “He of whom I am the mawla (the patron, master, and leader) of him 'Ali is also the mawla (man kuntu mawlahu fa 'Aliun-mawlahu). O' Allah! Be friend of him who is his friend, and be the enemy of him who is his enemy (Allahuma waali man waalaahu wa 'aadi man 'aadaahu).” With this act, the question of the successor, who was to govern the affairs of the Muslims, guard the Sunna (the body of customary behaviour based on the Prophet's precedent ), and uphold religious customs and laws, was settled for the Islamic society. The intent of the noble verse: 'O Messenger! Promulgate what has been revealed to you by your Lord, for if you do not, you will not have conveyed His message' (5:67) was carried out. The Most Noble Messenger [s] died shortly after returning to Madina. The above traditions of al-Ghadir are so abundantly reported and so commonly attested by hundreds of different transmitters belonging to all school of thoughts that it would be futile to doubt their authenticity. 3.The Holy Qur'an (2:164) [Tr].